There was a breakdown in communications between ambulance staff on the day of the 7 July bomb attacks in London, BBC London has learned. London Ambulance Service (LAS) documents obtained under the Freedom of Information Act show communications on the day "could have been better". But last year the LAS told a 7 July review committee that their radios "worked well". LAS admitted a problem with radios but denied withholding information. In November Russell Smith of the LAS told the London Assembly 7 July Review Committee that "they were not found wanting" and that their radios had "worked well". However, LAS documents showed senior staff relied on mobile phones - the mobile phone network went down temporarily on the day. Radio communications were hampered on the day because of the volume of calls and the pressure on staff in the ambulance control room. Ambulance crews relied on radios, but were not contactable once outside their vehicles, said London Assembly member Richard Barnes. Among problems were delays to ambulances reaching bomb sites and some hospitals receiving far more patients than others. Two hundred patients were sent to the Royal London Hospital while Homerton, Newham and Central Middlesex hospitals, which were all on standby, received none. Martin Flaherty, head of LAS, said they had not intentionally misled the review committee and discussions about the day were ongoing. "Technically the radios did work but there were capacity issues. "We are still in the process of providing detailed information about the response and I am confidant we will give the full picture." 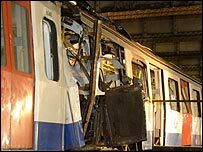 He went on to say that in response to the attacks, pagers had been reissued to its managers and a new digital radio system was due to be installed by 2008.